As we know it has been more than 4 years since the beginning of the 2008 crisis. Because it is one of the biggest and most important world financial system crunch there has been many studies for understanding its effects and how the other countries have been differentiated from this undesired economic conditions. In this study we wanted to give one example of those countries. This country is Germany. We will try to understand whether Germany have been differentiated in terms of some macro economic data from Euro zone countries or not. The data set have been chosen in order to reflect the latest situation of those countries. The latest year end data found in IMF WEO (World Economic Outlook) was 2011 data. Thus, our analysis will be mainly focused on 2011 year-end data of Germany and the other Euro zone countries. Since many statistical parametric tests require normality assumption we have made the following tests in order to understand whether the data are normally distributed or not. It can be understood from Kolmogorov-Smirnov analysis significance values. If the value is above 5% it means that the data can be accepted as normal distributed. As seen from the below table the following data sets are normal distributed. *. This is a lower bound of the true significance. The last data; Unemployment can be also accepted as normal since the value is slightly lower than 5%. Since we need to understand if Germany has been in a separate place or just it is somewhere in the group of Euro zone countries we have conducted t-tests. According to the following table since significance is far lower than 5% it shows that for all data sets Germany data is accepted as it is far away from the data sets’ means. 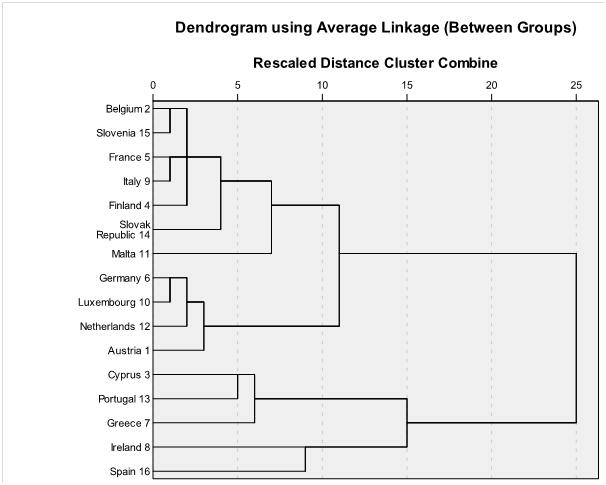 Hierarchical clustering is a method of cluster analysis which seeks to build a hierarchy of clusters. The number of clusters is found after the analysis according to the data relations. We will try to show whether Germany is drawn in a separate group or it is joined to one of the group of countries showing similar macro economic performance in the Euro Zone. According to the above figure, it is proved that Germany joins the same group with Luxemburg, Netherlands and Austria which have similar economic performance with Germany. However, these countries are totally differentiated from Cyprus, Portugal, Greece, Ireland and Spain (members of the PIIGS countries). As a result, Germany has been performing better than the Euro zone countries according to some macroeconomic figures according to t-test values. Furthermore, it was shown that Germany is in the same group with the countries showing better macroeconomic performances than other Euro zone countries. This means that Germany and the other countries like Luxemburg, Netherlands and Austria can be chosen as role models for the other countries for the following years for better performances.